We went to South Carolina last weekend to watch Jim’s nephew graduate from Marine Boot Camp at Parris Island. I learned SO much in the short time I was there! 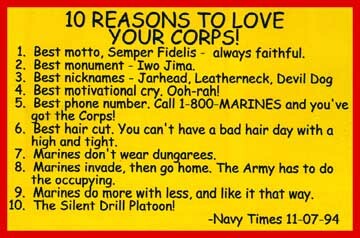 Parris Island is the Marine Corps Recruit Depot for all male Marines east of the Mississippi River and all female Marines nationwide. About 19,000 recruits are trained at Parris Island each year. On this day, 566 graduated from Marine Boot Camp — companies “M” and “N”, 3rd and 4th Battalions. That, and practically everyone displays this really cool logo (crescent moon & palm tree) for the State of South Carolina on their cars, in restaurants… everywhere! 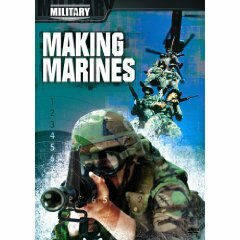 I’m told, the first thing the Marine recruits notice (from their seat aboard the bus that transports them from the airport to Parris Island) is: all the water, the marsh lands, and the fact that they’re actually on an island. During Boot Camp, Marine recruits are trained (or “programmed”) mentally, as well as physically, and morally. Here’s a day-by-day, week-by-week account of everything recruits do at Boot Camp: Training Matrix. You know… after attending a Boot Camp graduation at Parris Island, I can’t help but wish that every young man and woman (self included) would have to go through “boot camp” just to get through life. You know, right between high school and graduation. I think “boot camp” should be the next requirement before you can go to college, enter the armed services, start your own business… whatever. I was just completely impressed with the attitude and behaviors that these young recruits clearly learned in 12 short weeks. It is evident that this information is permanently etched into their brains now. The recruits I saw who had just graduated from boot camp truly did seem like they’re in a class of their own — the FEW, the PROUD, the MARINES. 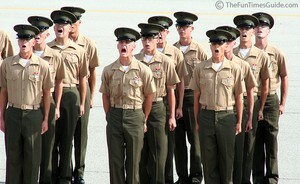 Check out the pictures I took from a recruit’s perspective entering the Marines! Pictures from the graduation ceremony. I get chills when I think back to the little bit of Marine activity I saw on that day. I was so impressed. 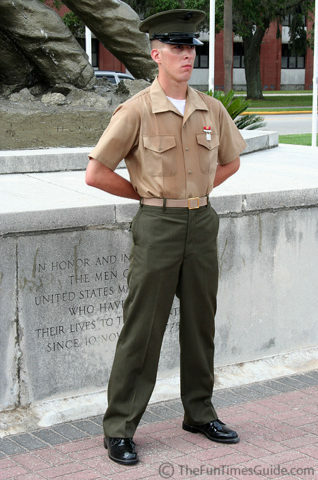 And I’m so truly proud … of our nephew, Benjamin …and all the Marine recruits who pass through Parris Island. Even the ones who didn’t make it… I’m so proud of them for trying. Be sure to ask a Marine to tell you about The Crucible! Recruits will travel 42 miles on foot during the event. There are 29 problem-solving exercises during the Crucible. It consists of 36 different stations. The recruits will have three meals, ready-to-eat (MREs) during the 54 hours. The recruits will be required to carry ammunition cans up to 50 pounds and dummies up to 100 pounds during the Crucible, in addition to 782 gear, uniform and M16 A2 service rifle weight. Here’s an excellent online movie about The Crucible experience.